Delta Outdoor Adventures operates a variety of activities for the entire family -- both during the winter and summer months. Winter activities include something as simple as a walk on snowshoes into the Alaskan forest to see what the wildlife tracks have written into the snow. Or--the more adventuresome can experience a snowmobile expedition far into the outback. Try your hand at catching a trout through the ice from one of our heated ice fishing tents. 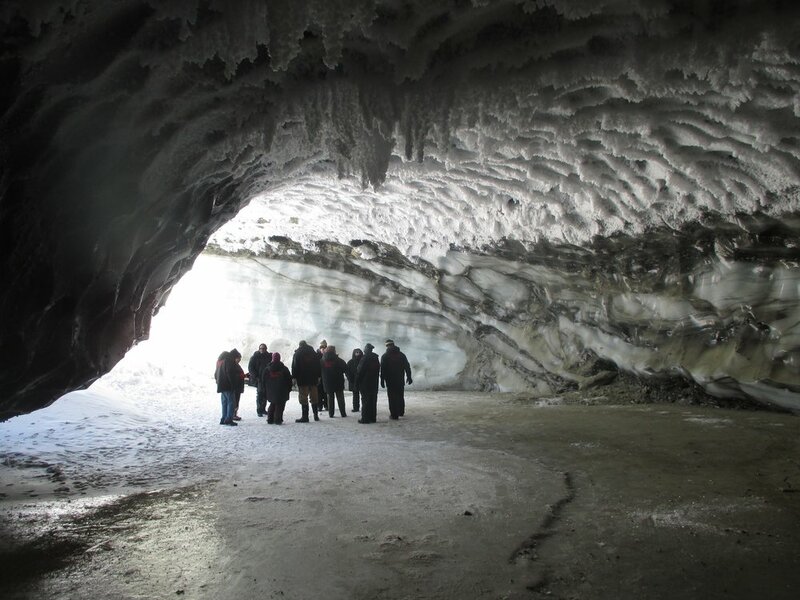 Explore the underside of a glacier and see the incredible crystals of an ice cave. 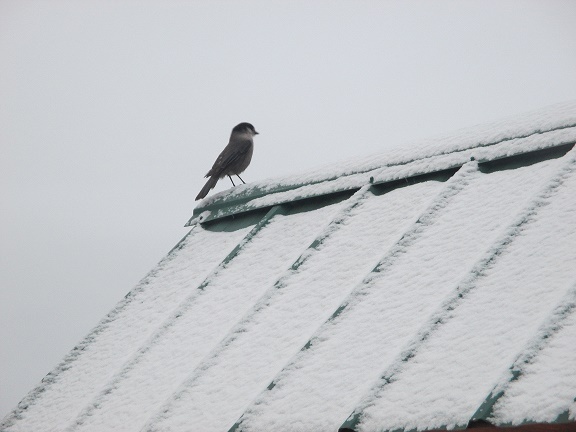 During the summer months; we offer August grayling fishing trips, basic birding tours and Denali Highway informational tours that explore the high country of the Denali Highway. October will find excellent photo opportunities for those who might wish to get some moose close-ups during the breeding season. John Schandelmeier will be your knowledgeable guide. A life-long Alaskan, John has spent his lifetime in the outback of Alaska. Take a walk into the Taiga near timberline. Read the text nature's creatures have left in the snow. Snowshoe hares are experiencing their peak in Alaska's Interior. We can usually find one of these snow white bunnies near the kennel. Sharptail grouse, coyotes, fox and lynx also call this area home. Moose and caribou are common sights in our area. We can usually find one for you to photograph. Take a trip further off the beaten path! Our snowmobile tours are tailored to fit the abilities of our guests. The average trip covers 20 miles and takes several hours. No experience is necessary, but riders should be physically able. Instruction and cold weather gear is provided. Try your luck fishing through the ice. Some luck, a little skill and a lot of patience are the requirements for a successful ice fishing trip. Remember; the fish have to come to you! Our area lakes have Rainbow and Lake Trout, Arctic Char and Landlocked Salmon. Heated ice fishing tents are provided when the temperatures are frigid or the wind is a bit too much! You won't get lost in Millers Cave! Come and check out the underside of a glacier! Most of Alaska's glaciers have some sort of ice cave. The summer snow melt streams carve serpentine caverns under the ice. Incredible crystals form near the entrances. Venture further inside and marvel at the compressed clear ice. One never knows what might be frozen into eternity under a glacier. Once, we found a long-frozen varying hare estimated to be over 1000 years old. This tour is dependent on the season. Ice caves change every season and are commonly not available until December --- and usually well into April. Transportation to the ice caves varies depending on cave location. Our most common cave; Miller, is a 4 mile trip by dog team or snowmobile. We can also do jeep tours to investigate the deep into the Alaska Range. Presently, December and likely early January have good conditions for travel. Moose, Caribou and Bison are readily available for photography and viewing. Conditions can change quickly; call for availablity. Our Summer trips are available from August 1st through mid-September. A few of our activities are still available into the month of October. Wildlife viewing, especially moose, are quite visible during the October rut. Travel by river boat on the Maclaren River during the month of August. Grayling are abundant in the clear streams flowing into the Maclaren until the 3rd week in August. Lake trout fishing will remain good until freeze-up, but if you opt for a late trip, be prepared for cold temperatures. Grayling trips start at $125 pp. May/early June trip; 195 PP. August trips leave from Maclaren River or Delta Junction. Meander along the Denali Highway at a leisurely pace. Stop for lunch at a scenic overview. Should it be raining -- have lunch at one of the Lodges spaced along the Denali Highway. Your guide is JohnSchandelmeier. John has 50 years on the Denali Highway as a resident or the Paxson/Maclaren area.. He knows the history and the landmarks as no other. Travelers will learn local history, geologic landmarks, flora and fauna. Plus stories from years spent traveling this area by foot, snowmobile, dog team and by airplane.